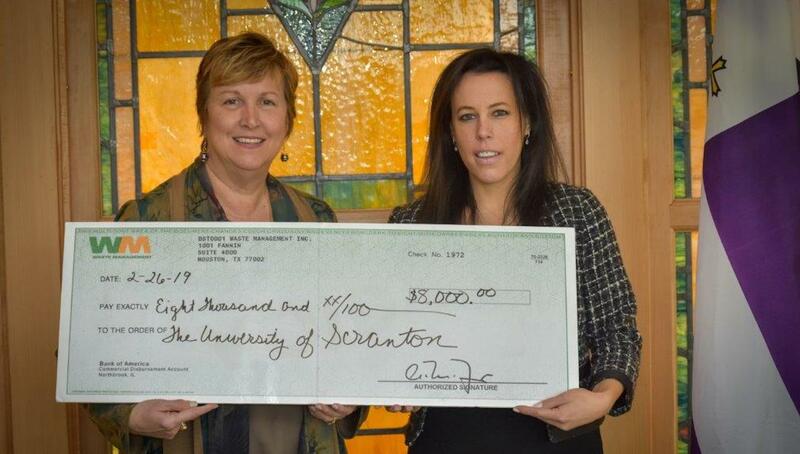 Debra Pellegrino, Ed.D., dean of the University’s Panuska College of Professional Studies, accepts a gift for the University of Scranton’s University of Success program from Christina Weaver, account manager for Waste Management. The University of Success is a four-year program that prepares promising high school students for college. Waste Management has provided continuous support for this program since 2012. Waste Management contributed $8,000 to support The University of Scranton’s University of Success, a multi-year, pre-college program for high school students designed to develop the skills needed to successfully gain entrance to college. Students enter the University of Success at the completion of the eighth grade and continue through their high school years. The program offers enrichment courses in study skills, SAT prep, public speaking, math, science, art and cultural activities, as well as financial aid and wellness seminars. The ultimate goal is for University of Success students to be accepted into a four-year college or university. The University of Success, offered free of charge to participants, is funded almost entirely by corporate and foundation grants. Waste Management has provided continuous support for this program since 2012. For additional information, visit the University of Success web site.